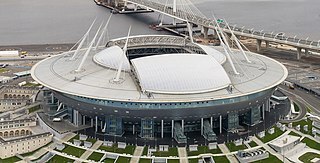 Gazprom Arena (Russian: Газпром Арена) is a retractable roof stadium with a retractable pitch in the western portion of Krestovsky Island in Saint Petersburg, Russia, which serves as home for FC Zenit Saint Petersburg. The stadium was opened in 2017 for the FIFA Confederations Cup. It was called Saint Petersburg Stadium during the 2017 FIFA Confederations Cup and 2018 FIFA World Cup. The competition between architectural projects was won by Kisho Kurokawa's "The Spaceship". The design of the stadium is a modified and enlarged version of Toyota Stadium in Toyota City, Japan, which was also designed by Kurokawa. The stadium was built on the location where the former Kirov Stadium used to stand before it was demolished. In January 2009 The St. Petersburg Times reported that the project was now to be funded by the city government of St Petersburg, with Gazprom switching to build a separate skyscraper project. The City Hall had to step in after Gazprom declined to invest any further money into the stadium's construction. On 25 July 2016 the general contractor, Inzhtransstroy-Spb, issued a statement that the city authorities have failed to pay 1 billion rubles ($15.8 million at the current exchange rate) worth of construction work and stopped the work. The next day the contract was terminated. On 1 August there were reports of wind damage to parts of the metal sheathing, and a flood. In the end of August 2016, the new general contractor, Metrostroy, resumed construction works on the site. The first official match held at the stadium was the Russian Premier League game between FC Zenit Saint Petersburg and FC Ural on 22 April 2017. Branislav Ivanović scored the first goal in the stadium's history. On 17 June 2017, the first game of 2017 FIFA Confederations Cup was held on the stadium with the Group A match between the host Russia and New Zealand. On 2 July 2017, the 2017 FIFA Confederations Cup Final was held at the stadium between Chile and Germany, becoming the most attended match of the tournament and also setting the record attendance for the stadium. On 19 September 2014, it was announced by UEFA that the stadium will host four UEFA Euro 2020 finals fixtures, three group games and a quarterfinal match. Navigation and information support from volunteers. Information (children registration point, stroller storage, lost and found office). Audio descriptive commentary for fans who are blind or visually impaired. Saint Petersburg Arena offers 560 seats for people with disabilities, 266 of them are for wheelchair users. Moreover, the stadium design includes special lobbies, elevators and ramps to ensure accessibility to spectators with limited mobility. The stadium has been fully prepared for the FIFA World Cup games in accordance with the FIFA requirements for capacity and security. The stadium is equipped with a video surveillance and identification system that makes it possible to detect any troublemakers and fans who are not allowed to enter. The arena is also equipped with a security alarm system, a fire alarm system and a robotic fire-extinguishing system. ^ "Стадион "Санкт-Петербург". Информация о стадионе". Официальный сайт ФК «Зенит» (Санкт-Петербург) // fc-zenit.ru. ^ "Стадион "Санкт-Петербург". Информация о стадионе". Некоммерческое партнёрство «Российская футбольная премьер-лига» // rfpl.org. Retrieved 11 August 2017. ^ "Стадион "Питер Арена". Факты о стадионе". // piterarena.com. 2016. Retrieved 22 April 2017. ^ "Zenit's stadium on Krestovsky Ostrov to be renamed as The Gazprom Arena / FC Zenit St Petersburg Official Website". ^ a b "Match report – Group A – Russia - New Zealand" (PDF). ^ "Case Study – What Happens When Corruption Meets Incompetence - Krestovsky Stadium". Moscow Times. 13 May 2017. Retrieved 3 June 2017. ^ "FIFA confident that stadium in St. Petersburg will meet all requirements". TASS. 26 December 2016. Retrieved 30 December 2016. ^ FIFA.com. "2018 FIFA World Cup Russia - Destination - FIFA.com". ^ "City Hall Pulls Out of Skyscraper, Redirects Funds to New Stadium". The St. Petersburg Times. 13 January 2009. Retrieved 27 May 2012. ^ "У "Зенит-Арены" снесло крышу" (in Russian). Retrieved 9 August 2016. ^ "Строящийся стадион "Зенита" начал уходить под воду" (in Russian). Retrieved 9 August 2016. ^ "Мутко: уровень беспокойства за стадион в Санкт-Петербурге понизят в сентябре" (in Russian). Retrieved 4 September 2016. ^ "Match report – Final – Chile - Germany" (PDF). ^ "Match report – Group A – Russia - New Zealand" (PDF). FIFA.com. Fédération Internationale de Football Association. 17 June 2017. Retrieved 17 June 2017. ^ "Match report – Group B – Cameroon - Australia" (PDF). FIFA.com. Fédération Internationale de Football Association. 22 June 2017. Retrieved 22 June 2017. ^ "Match report – Group A – New Zealand - Portugal" (PDF). FIFA.com. Fédération Internationale de Football Association. 24 June 2017. Retrieved 24 June 2017. ^ "Match report – Final – Chile - Germany" (PDF). FIFA.com. Fédération Internationale de Football Association. 2 July 2017. Retrieved 2 July 2017. ^ "Match report – Group B – Morocco - IR Iran" (PDF). FIFA.com. Fédération Internationale de Football Association. 15 June 2018. Retrieved 15 June 2018. ^ "Match report – Group A – Russia - Egypt" (PDF). FIFA.com. Fédération Internationale de Football Association. 19 June 2018. Retrieved 19 June 2018. ^ "Match report – Group E – Brazil - Costa Rica" (PDF). FIFA.com. Fédération Internationale de Football Association. 22 June 2018. Retrieved 22 June 2018. ^ "Match report – Group D – Nigeria - Argentina" (PDF). FIFA.com. Fédération Internationale de Football Association. 26 June 2018. Retrieved 26 June 2018. ^ "Match report – Round of 16 – Sweden - Switzerland" (PDF). FIFA.com. Fédération Internationale de Football Association. 3 July 2018. Retrieved 3 July 2018. ^ "Match report – Semi-final – France - Belgium" (PDF). FIFA.com. Fédération Internationale de Football Association. 10 July 2018. Retrieved 10 July 2018. ^ "Match report – Play-off for third place – Belgium - England" (PDF). FIFA.com. Fédération Internationale de Football Association. 14 July 2018. Retrieved 14 July 2018. ^ UEFA.com. "UEFA EURO 2020". UEFA.com. ^ "Люди с ограниченными возможностями протестировали стадион "Санкт-Петербург Арена"". sankt-peterburg.glavny.tv (in Russian). 6 March 2017. Retrieved 14 June 2018. ^ "Технические характеристики | Чемпионат мира по футболу FIFA 2018 в России™ | Город-организатор Санкт-Петербург". spb2018.com. Retrieved 14 June 2018. ^ "Директор по безопасности "Зенита": "Делаем все, чтобы на арене "Санкт-Петербург" людям было комфортно"" (in Russian). Retrieved 14 June 2018. Wikimedia Commons has media related to Gazprom Arena.